Wearing: totally awesome Cellini loafers from Zomp!!! Obviously this is NOT a mommy style post as I would not wear this outfit out, but I can’t help telling you how much I LOVE these loafers! Sooooooooo I had a tragic realisation recently. Last time I was pregnant it was summer. So my maternity wardrobe consists of flowy dresses, cute tops, skirts and shorts… not really appropriate for an Iowan winter hey?! Of course I’m a little irritated by this. For some reason last time I thought I was making a one time maternity wardrobe purchase and that I wouldn’t ever need to do it again (naive I know). And now I need a winter maternity wardrobe? Oh the frustration! I know I will probably have to buy a few things, but I’d like to try and make as much as possible as my fabric stash is huge and my budget is… well not! The first project I decided to take on was a pair of maternity pants. 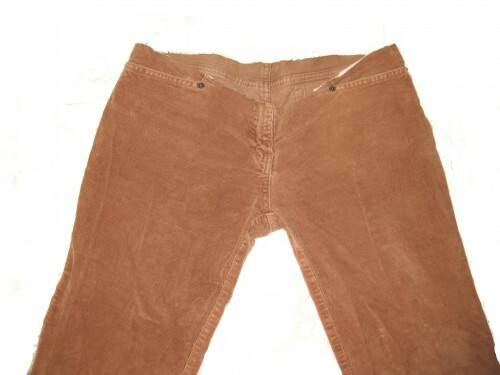 I love these corduroys. They’re a hand me down from my SIL and I LOVE THEM, they’e super comfy and so warm. Unfortunately I ripped the waistband really severely last winter making them unwearable, so I’m really happy that I’ve found a way to salvage them! This was a really really simple refashion/ DIY kind of thing if you’d like to do it yourself. I know there are a lot of tutorials out there on how to sew an overbelly belly band onto a pair of jeans, thus creating maternity jeans. Personally I don’t see the point. 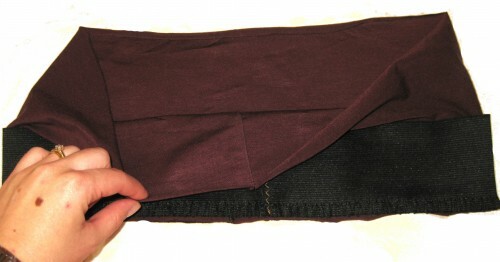 For one thing the type of spandex used in retail maternity clothing for over belly bands is incredibly difficult to find, and regular jersey just really doesn’t have the strength to hold up a pair of pants, and secondly I find the overbelly style of maternity pants super frustrating. Due to their design you can’t really use them in the first few months of your pregnancy when your belly is too big for regular pants but too small to hold up a giant piece of spandex. As a result I only wear the under belly style of maternity pants as these can be worn at any stage and the stronger elastic it uses holds your pants up better (I am not a fan of pants that constantly travel south!). Next I very carefully cut out the zipper. The reason for this is that most jeans/cords have metal zippers which no sewing machine can handle sewing over, so it needs to go bye bye. I then sewed closed the fly, as now that there was no zipper there was an opening. I then cut my elastic. This is very wide 2.5″ waistband elastic – I chose it based on it’s thickness (the thicker the elastic the less likely it is to cut into you) and also it’s stretch was the closest I could find to my retail maternity pants waistbands. I cut my elastic a few inches shorter than the waistband so that it would help out my pants up! I also cut some jersey to cover the elastic and be soft against my skin (I don’t like the feeling of elastic against me, it’s itchy!). I cut my jersey the same length as the elastic and double the width. 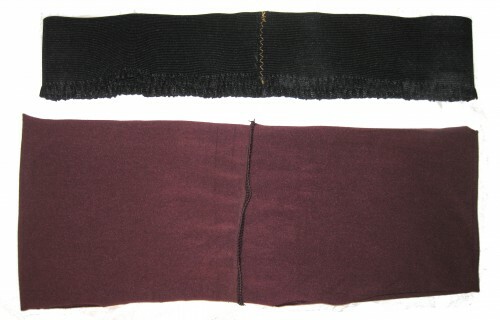 You may choose to add on 1.5″ to the width of your jersey fabric if you do not want to sew the elastic to the actual pants. My elastic has a handy bit on the edge for the purpose of being attached to the clothing, which is why I didn’t add on extra for the seam allowance (ie my elastic is being sewn to the pants). I really like it like this as the elastic won’t twist. Encased the elastic in the jersey. Note that I did not line up the seams of the jersey and elastic exactly. The reason for this is that once I sew all this together it’s going to be very thick (remember that denim and corduroy are very thick and have thick seams) and I don’t want my machine to die! Then I sewed the elastic/jersey to the edge of my pants. 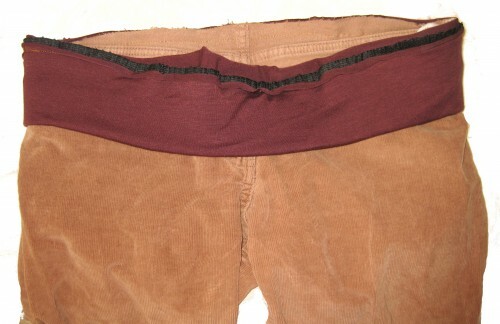 Remember that the elastic and jersey are a little smaller than the waist of the pants? So I needed to stretch the elastic/jersey a little as I sewed. Don’t forget to use a Denim/Jeans needle for your machine. Don’t skimp on that part, it’s really necessary. A universal needle just can’t handle the thickness of denim and corduroy. I used my serger/overlocker to neaten up the edges. I know a lot of people like to use their sergers for everything. I am not one of those people. It has it’s place of course, but I really don’t think a serger could have given this waist the stability it needed, so I just used it as a finishing touch. I know that looks like a lot of steps (mostly because I waffled!) but it’s very easy, it took under 20 minutes, who can complain about that!!! Now as a side note, I wouldn’t normally wear these pants with such a short top, I just have in the photos for the purposes of showing you how the waistband fits. And in randomness, there’s a little fall chill in the air, and I’m starting to dream of boots and trench coats (and pretending that winter doesn’t exist, just months and months of beautiful fall!). My next project is a maternity winter coat, as none of my lovely warm coats will fit this winter (baby is due end of february). 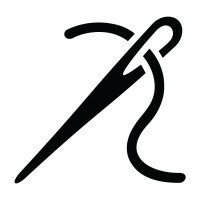 It’s going to be an undertaking, but I’m really excited about doing some tailoring, as I really haven’t for a while. I have a pattern in mind, and i”ll update you all when I get organised!! Those turned out really well, and they look really comfortable! What a great idea! I am filing this away for if and when one of my three daughters needs me to do this for them. When I was expecting my oldest daughter (who is now 27) I put a panel in a pair of jeans. I had to keep hitching them up. I don’t think the band idea even existed then. Maybe it is because my daughters are all under 30 but I think you look just fine the way you are dressed. It is awesome how pregnancy is embraced and shown off now in maternity style instead of being “cloaked” as it used to be back in the day. So glad to see your back! The pants look great, and your tummy is so cute! We’re due almost the same time! I love these pants, and they almost don’t look like maternity wear. I’ve resorted to homemade Bella Bands to keep my pants up, but this is a great idea. I can’t wait to see more! And I think you’re so cute! Pfft. If you can’t show off a belly while pregnant, when CAN you show it off? Cool pants, and I will never, ever in my life again need to know how to do this, but it was well written. Now I need to go kiss my half-grown kid and tell him I’m glad he’s an only child! I was thinking about you yesterday as I was thinking about bloggers I’ve enjoyed who are taking a holiday. Glad you are doing well. I just wanted to say thanks for this. I too am due the same time you are, and am just beginning to think about maternity clothing. This is really helpful. Beautiful! Filing this away for next time I need it. thank you soooooo much for this tutorial. I am due mid March and I’m so frustrated with the options out there for maternity clothes (Pea in the Pod or Motherhood–oh yeah, they’re the same company). Everything is polyester! Anyway, I have been looking for how to make some WOOL maternity skirts and pants out of old pairs (or thift finds) and this looks like the perfect solution. I can’t wait to see your winter coat. I’m dreading that search too, but I don’t think I’m going to tackle making my own…I’ve got too much to make for the babe. Thank you!!! I’m running out of pants and the maternity stuff in the stores seem to be too expensive or not my taste! Jennie your pants look great! 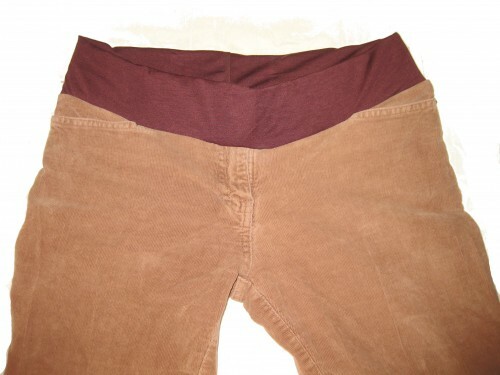 I recently bought a pair of maternity pants (from Goodwill for $4, can’t go wrong) with a semi-full front panel. They fit great, except they wouldn’t stay up even if I folded the panel over and tugged on the elastic drawstring waistband. I ripped the old knit panel out and replaced it with 2″ elastic and scraps from an old tank. To my surprise, as sewing with knits I have yet to master, it turned out perfect-stretch and all!! Thanks for the tute! Thank you thank you!!!! My Best friend is prego and as her I both though we were done with babies we both got rid of the maternity stash! Now prego with #3 she has no $$$ to buy a new maternity wardrobe and we have been trying to figure out what to do about it I think this will work great for some of those legs fit great waist it too tight jeans she has and as hubby just agreed to try for #4 for me I am not going to be in any sort of retail shopping state either! Now I am going to see if this will salvage my favorite jean skit that the high waist in it won’t fit over my birthing hips!!! I’m sew (ugh, I know..bad pun) excited to try this! I’m only 12 weeks along but I’m already finding my pants uncomfortable. Great idea and instructions are clear and well written! Thanks for the ideas! Just tried these pants and you are right – so quick and easy! Although I think I might have an issue with some pairs of pants – pulling them up over the hips (and bum) with the fly sewn up. Any clues on how to leave a little extra give for when you are putting the pants on? I’m 20 weeks pregnant and I love under belly maternity jeans. All of a sudden I can’t find ANY in my size. I just finished my first pair and LOVE LOVE LOVE them! Thanks Megan!